Pinning it's a tactical procedure common to many games. 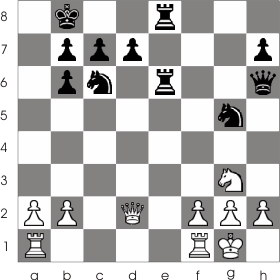 You can use it in any phase of the game; in fact many openings use this tactic to disturb the opponent's piece development. Pinning involves the participation of three pieces: a piece is attacking another one which is being protected by a third one placed between the two. In the following position we have more than one of these tactical procedures. 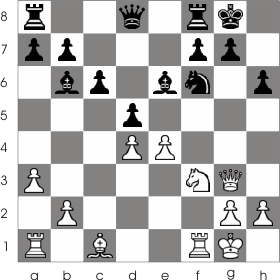 The white pawn at b4 is pinned by the black rook at a4. Now you can understand why it's called pinning: the pawn is unable to move because then the white rook would be captured with 1. Ra4:c4. The white pawn at f3 is also pinned because it's placed between the king at e2 and the black queen at h5 (the pawn can't be moved because then the king would enter under the range of action of the queen). Some of Black's pieces are also pinned. If it were Black's turn to move then he wouldn't be able to capture the rook at f6 with the knight from d5 because the knight is pinned by the queen from d1. As a side remark: capturing the pawn at b4 with the rook 1...Ra4: b4 is wrong because after Rc4:b4 Black is unable to capture the white rook with the knight from d5 . The black rook at e5 is pinned by the bishop from g3. You can see, of course, that if a piece is pinned to the king, it is unable to move; if it's pinned to another piece it can move. 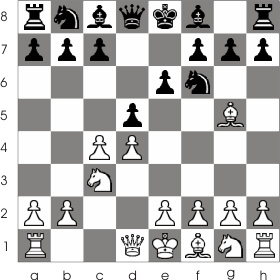 The following moves are common to the queen's Gambit 1. d4 d5 2.c4 e6 3. Nc3 Nf6 and with 4. 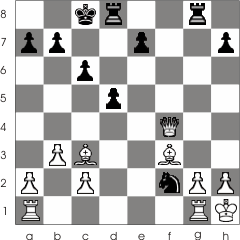 Bg5 White pins the black knight to the queen; the resulted position is shown in the next example. In the example below after 1... Rg8:g4 White is unable to capture the rook because the pawn at f3 is pinned by the bishop from b7. 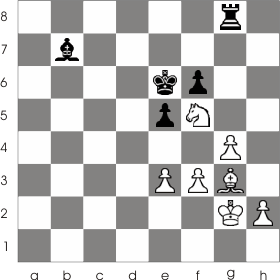 In the next example White pinned, with his queen, the black knight at g5 which was protected by his queen. 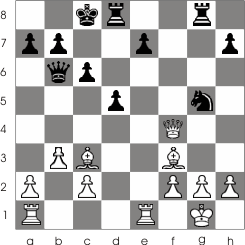 But with 1...Nf3+ Black checks the white king and after g:f3 Black captures the unprotected white queen : Q:d2 . In the next position White moved the queen at g3 and pinned the pawn from g7. Black didn't give much attention to this and took no actions. That allowed the following move: 1.Bc1:h6. Black can't capture the bishop with his pawn because that would place his king in check from the white queen. Now White won a pawn and not only that: he now threatens checkmate with the queen at g7. This type of pinning (the pinning of the pawn in front of the castled king) is quite frequent so pay attention to it in your games. Example of pinning combined with discovered attack This example shows you the full power of tactic. You'll see here how a few combined tactical procedures can help you win the game. It's Black's turn to move. You can see that the pawn in front of the white king can be pinned by the black rook from g7 if that knight from g5 wouldn't interrupt the rook's range of action. Black moves: 1... Ng5-h3!! This is an excellent move as it allows the black rook to pin the pawn and perform a double attack over the king and queen. 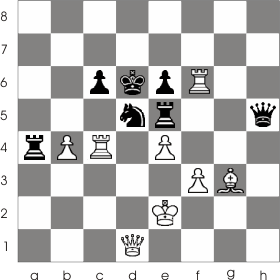 (Remember the pawn in front of the king is unable to capture the knight because it's pinned.). But this is not the end! A less careful player could be tempted to capture the queen and miss out on a much greater gain. If you look more careful you can see that the f2 square is under the control of the black queen . White is unable to move his king at f1 because then it would be checkmated. The only place where he can move is 2. Kg1-h1 Now Black takes advantage of his superior position and 2... Nh3:f2+ The white king has nothing to do but to go back to the exposed square 3. Kh1-g1 Now White can check the king by an discovered attack with the knight: 3... Nf2-h3+ double check from the knight and queen (notes how the white king is constrained only to the exposed squares h2 and g2). What follows it's a great execution that brings out the artistic side of chess : 4. Kg1-h1 Qb6-g1!! 5. Re1:g1 Nh3-f2 Checkmate. This type of checkmate is called etouffe; the term comes from french an means suffocated. 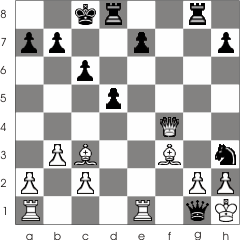 (The king is obstructed from moving from the attacked position because he is suffocated by it's own pieces).